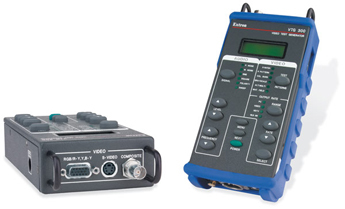 The Extron VTG 300 is a handheld, battery-operated video and audio test generator featuring high resolution computer-video, HDTV, and 16:9 rates, as well as standard definition NTSC or PAL video rates for RGB, component video, S-video, and composite video. The VTG 300 is lightweight and compact for portable field use or bench testing. 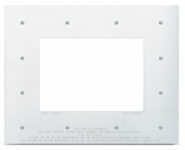 As a versatile, broadcast quality reference tool, this test generator can be used for projector set-up, performance evaluation, alignment, convergence, calibration, synchronization, troubleshooting, and accurate video and audio signal reproduction in professional AV applications.